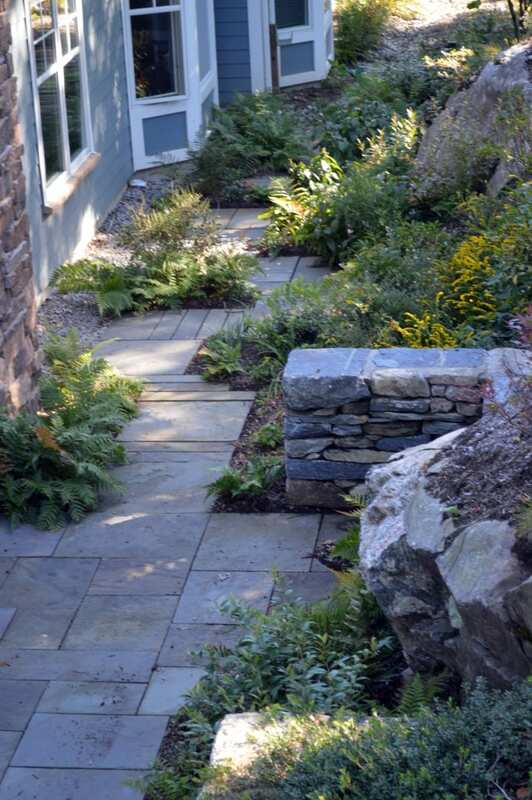 Landscape architects confront distressed and disturbed landscapes on a frequent basis. The ideal project involves a landscape architect from the beginning when proactive care is taken to protect the site and existing vegetation. However, the ideal often meets with the circumstantial when the LA is enlisted after key site planning decisions are made or even following the commencement of construction; new buildings, infrastructure or site work often leave a wake of destruction to soils, plantings, and natural drainage patterns. 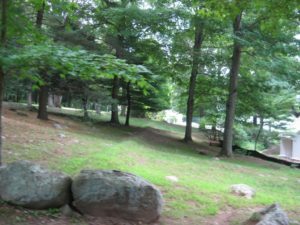 As a result, landscape architects must frequently apply ecological restoration strategies and planting concepts to heal a post-traumatic landscape. 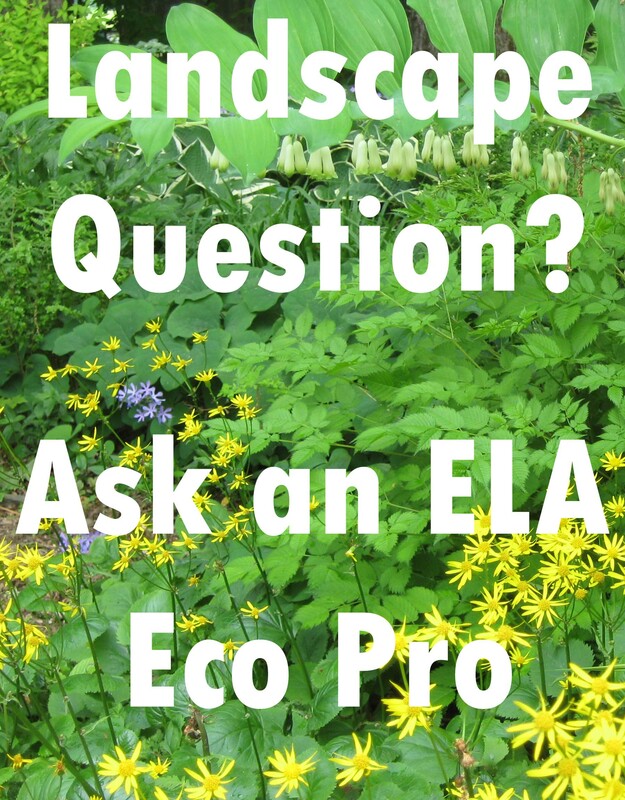 Wikipedia defines ecological restoration as “the practice of renewing and restoring degraded, damaged, or destroyed ecosystems and habitats in the environment by active human intervention and action.” Thus, ecological restoration can become the role of the landscape architect with the goal to create a beautiful, resilient and predominantly native habitat in a designed landscape. In my practice, I derive great interest and ultimate satisfaction when ecological restoration comes into play on a project. 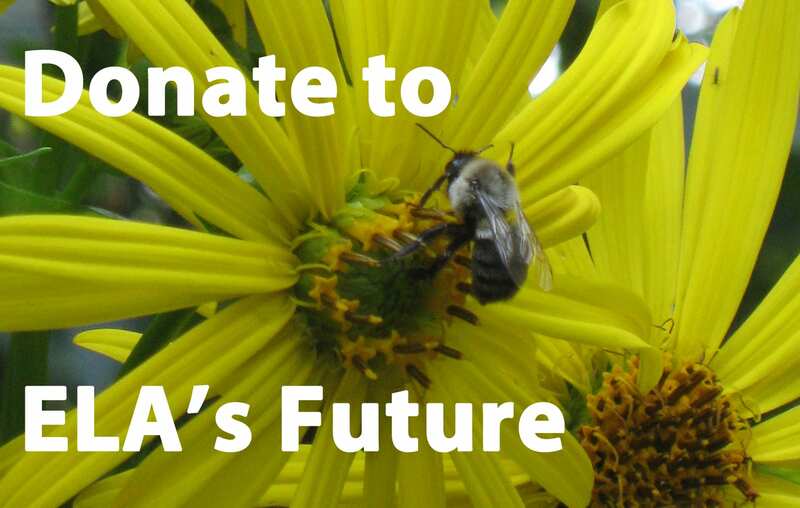 My approach differs from that of a restoration ecologist who will determine exactly the sort of habitat that has been lost and how best to restore it. As a designer, I apply the skillset of observation, programming, and inventory to establish the best strategies for restoring a site. 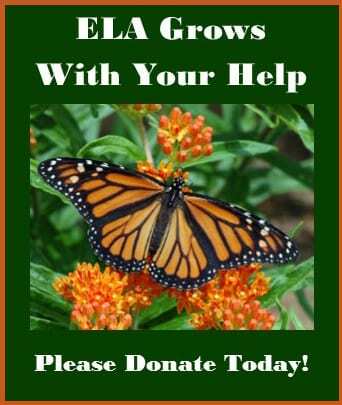 Additionally, I work with ecologists on selected projects to establish parameters of restoration. 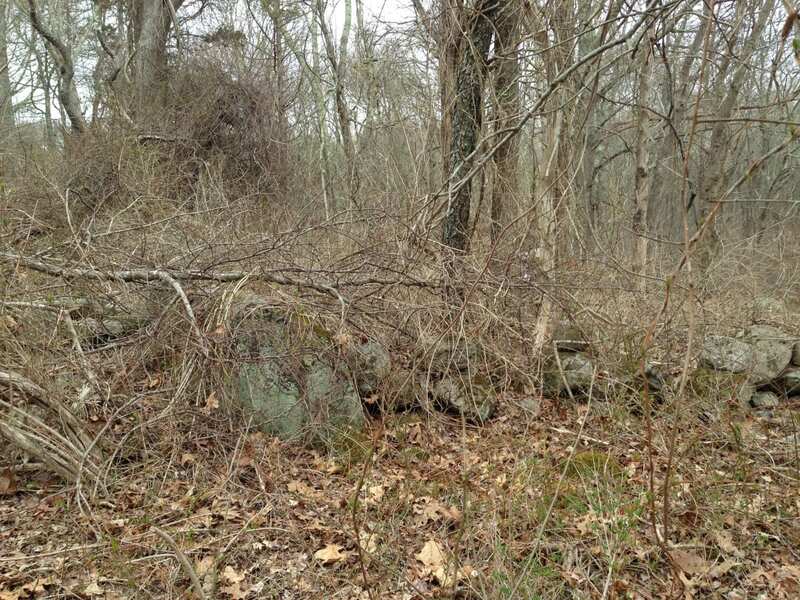 In addition to construction-damaged sites, other projects present landscapes that have been neglected or abused, often without the knowledge or consideration of the current property owner. Through four case studies, this article will address both of these conditions and our solutions to restore and improve the landscapes that are abused in the course of improvements. 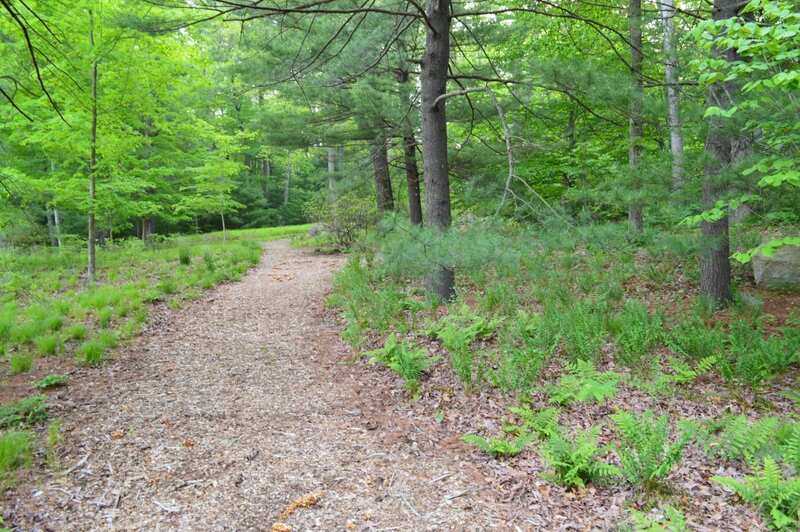 A second growth, vestigial woodland was composed of a few native trees (pine, maple, oak). Minimal understory vegetation and eroded, depleted soils dominated the ground plane and often contributed to habitat degradation. 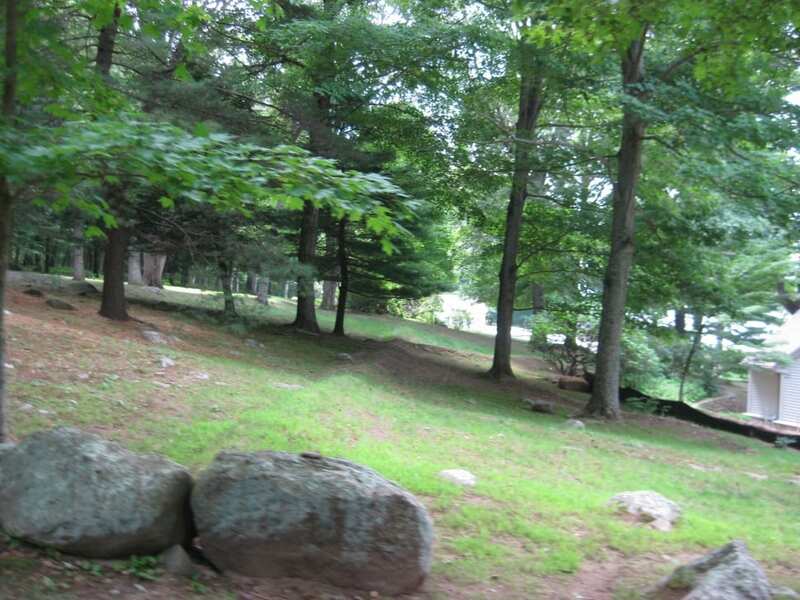 Despite the previous owner’s attempts to create check dams on the hillside, flooding issues frequently plagued the house and gardens at the bottom of this hill. 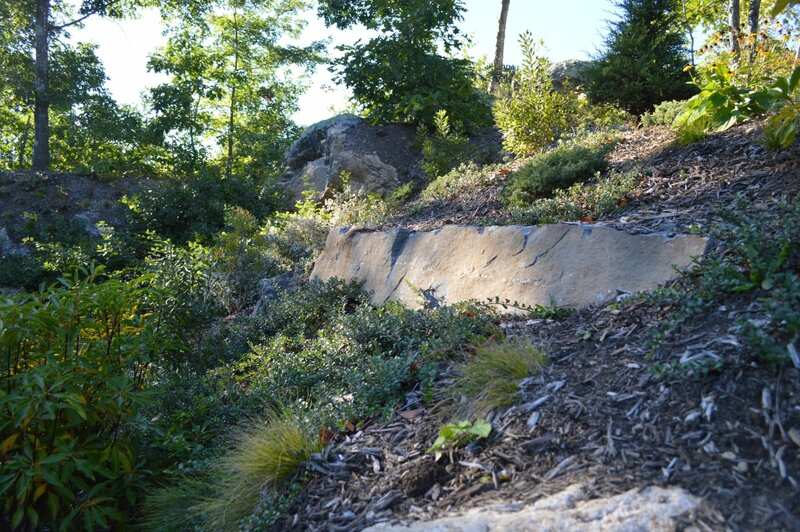 The solution was to revegetate the hillside with a two-pronged strategy: a transition across the slope from sun to shade dictated different plant palettes. 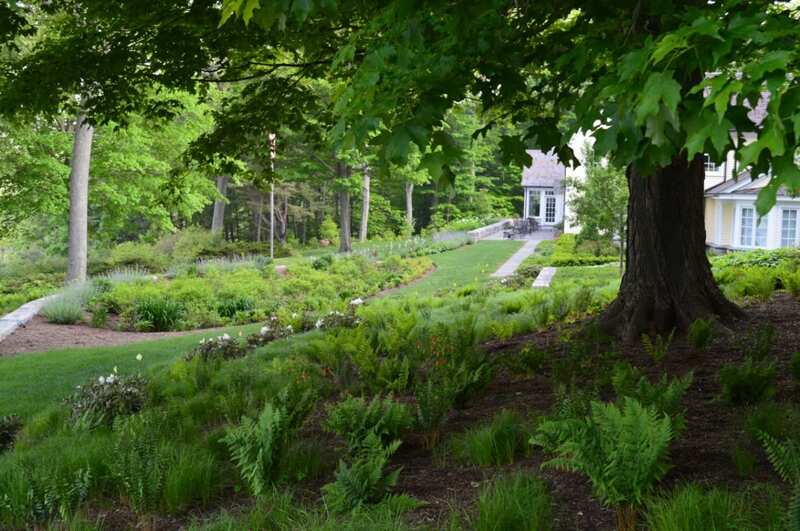 In the shady zones with mature native canopy trees, we planted to develop a transitional woodland: with shady groundcovers, shrubs, and seedlings of native trees. In sunnier areas, we planted herbaceous and woody meadow species as well as young forest trees that would, over time, re-establish the forest canopy in the future. The herbaceous layer in both cases is critically important: by planting several thousand landscape plugs, we were able to modify the soil structure and create openings for infiltration and a roughness quotient that slows down stormwater, thereby stopping the erosive activities and drainage problems on site. 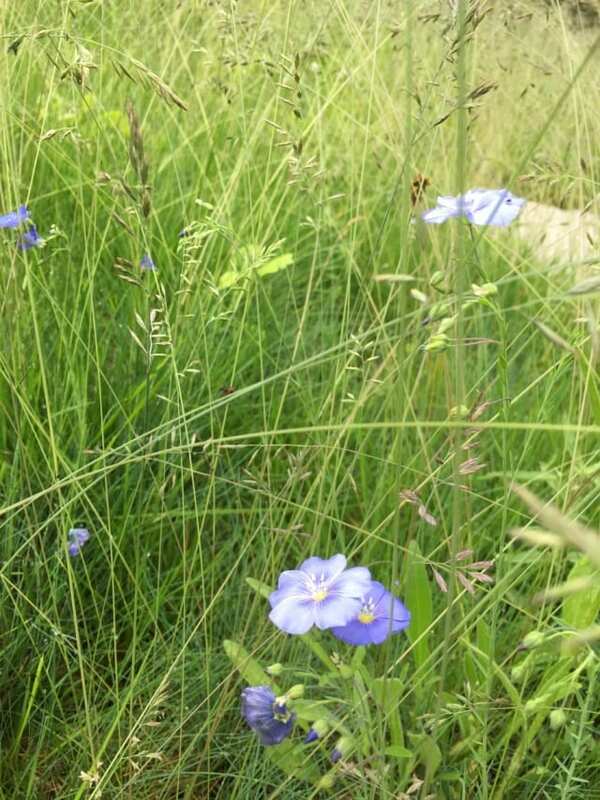 Species selected for the sunny zone: native perennials and warm season grasses. Woody species included Myrica pensylvanica, Gaylusaccia baccata, Arctostaphylos uva-ursi, and Rosa caroliniana. As the slope transitioned to more shade, we employed species such as Kalmia latifolia, Vaccinium angustifolium, Rhododendron periclymenoides alongside native fern and grass varieties. 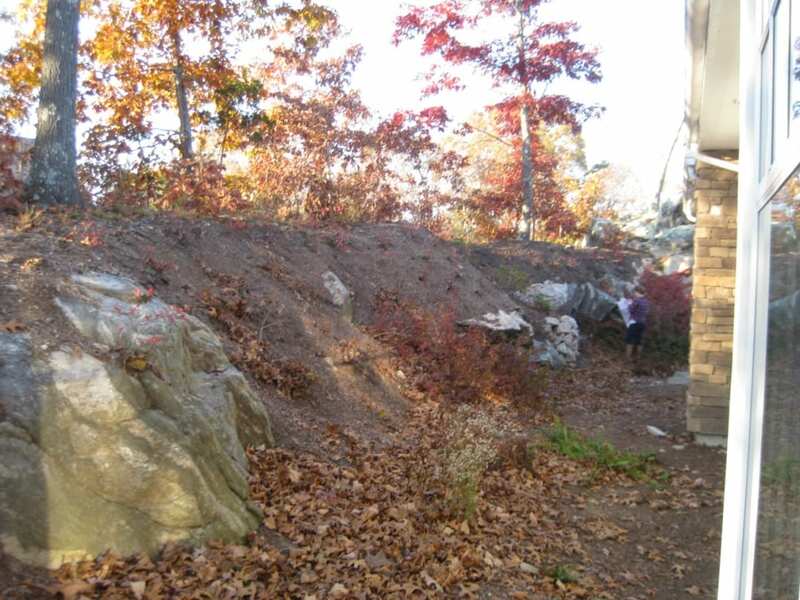 This project featured a disturbed, nearly destroyed landscape as a result of blasting at this condominium complex. Our client wanted to have a space for outdoor dining as well as attractive plantings. With these enlightened clients, we engaged in a collaborative journey of not only creating a designed landscape but also restoring the land that had been so mistreated. A shear blasted hillside that rose nearly vertical from the building ground floor elevation to the top of the ridge. The ridge top was still intact, with hickories, oaks, lowbush blueberry, and huckleberry. We had something to work with. The slope was modified with a native fieldstone retaining wall to reinforce the slope and define the new bluestone terrace. 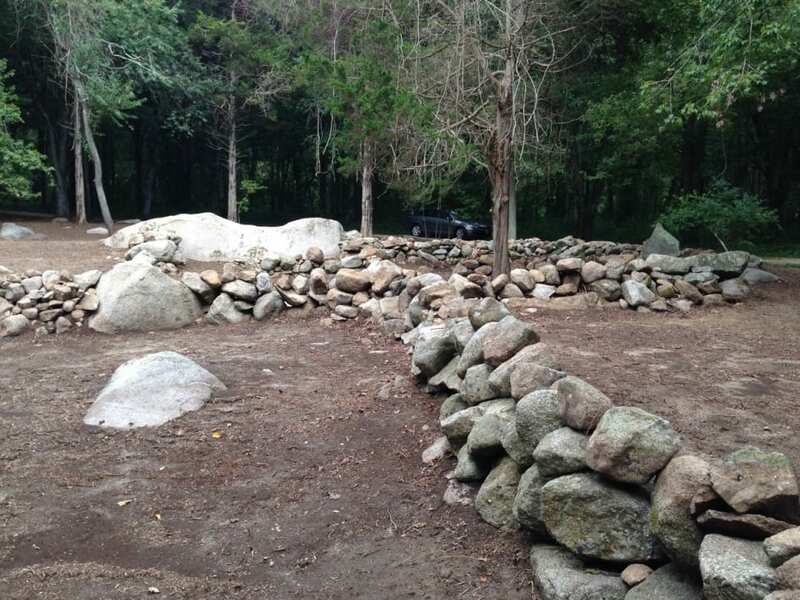 Solid granite retaining stones allowed us to create planting pockets at the mid-slope. A resilient planting palette was selected for the sunny areas including Rhus ‘Gro-Low’, Arctostaphylos uva-ursi, Myrica pensylvanica, Juniperus sp. and Carex sp. 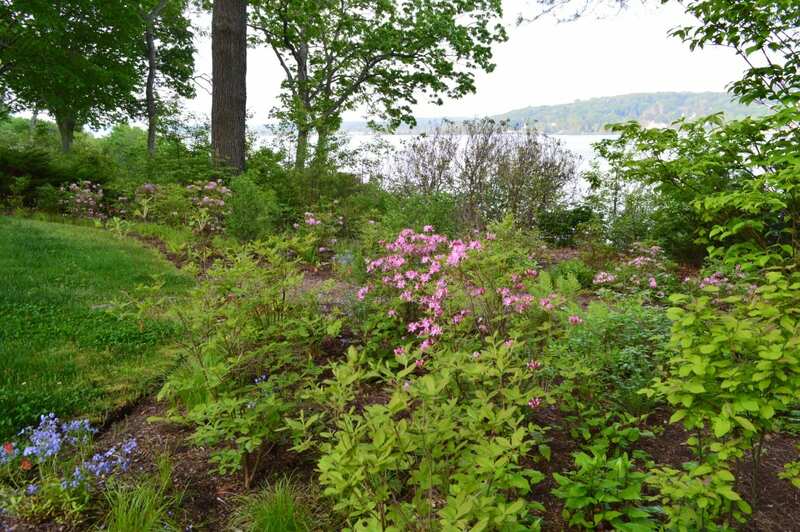 In the shadier areas, we selected native ferns and Phlox at the base of the slope with Vaccinium angustifolium, Kalmia latifolia, and Viburnum dentatum in the mid- and upper-slopes. A thicket of bittersweet, multiflora rose, burning bush, and shrub honeysuckle were cleared and grubbed from this one-acre site. A few native trees and shrubs were salvageable and marked for preservation. A bonus aspect of the project was the discovery of historic stone walls and foundations from a late eighteenth century farmstead. The walls were restacked and the structure of the farmstead was revealed. Working with an ecologist, we determined that a grassland restoration would be both appropriate and ecologically beneficial. 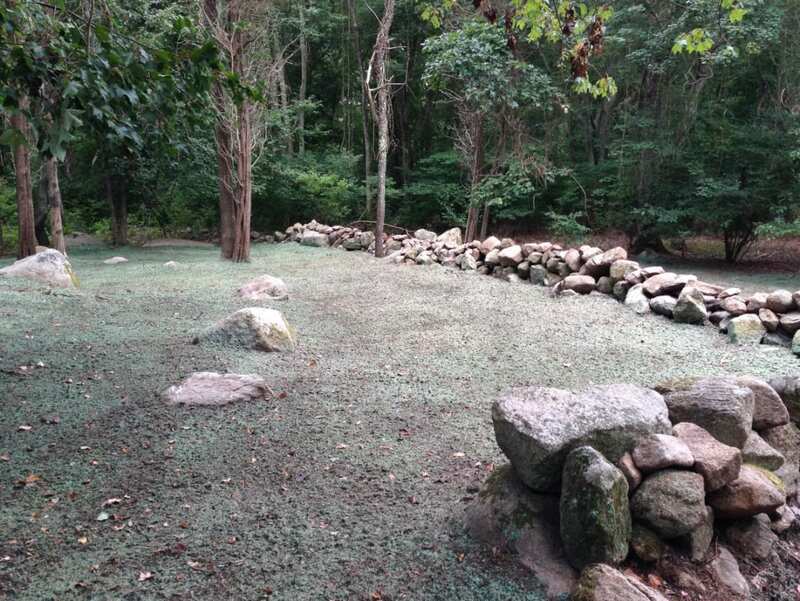 The area was hydroseeded with a mix of native/naturalized grasses and perennials for both sun and shade; mix specified and supplied by Ernst Conservation Seeds. Monitoring and maintenance includes bi-annual mowing and selective removals of invasives. 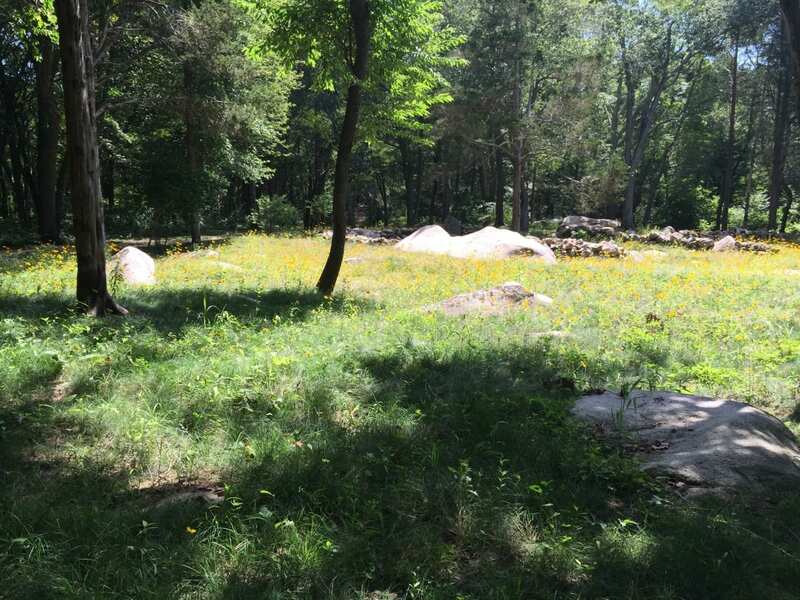 The existing site transitions from salt marsh to a boulder-strewn maintained lawn. 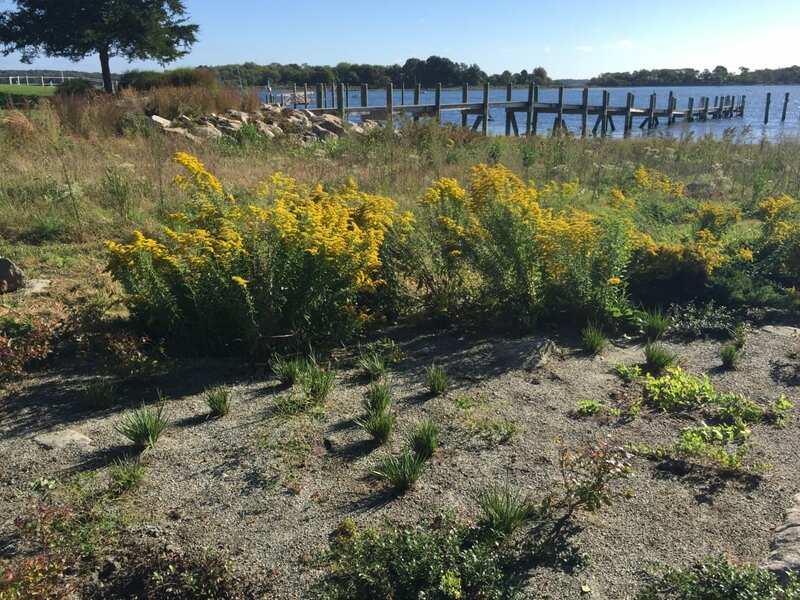 Enthusiastic clients embraced the idea of developing a pollinator habitat to enhance the ecology of their coastal property. 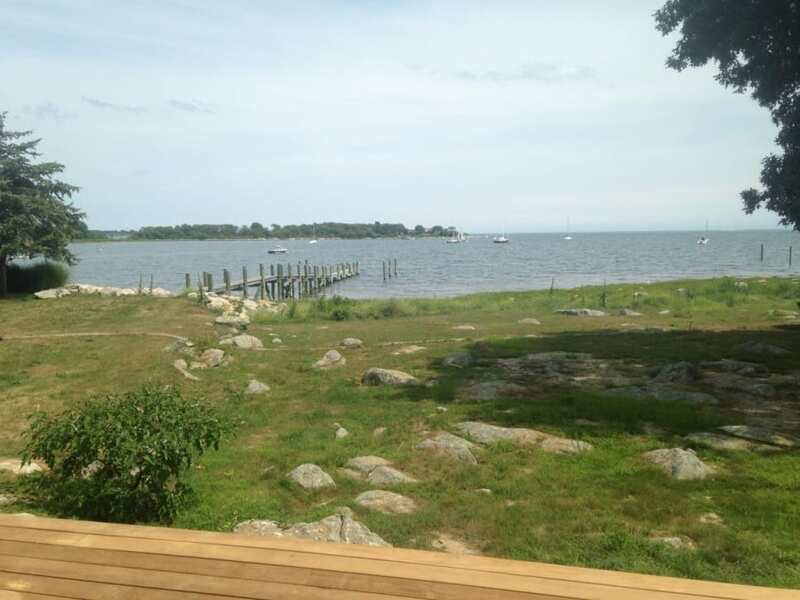 Closely collaborating with an ecologist, we designed and planted a coastal grassland to modulate between the salt marsh and the lawn area. 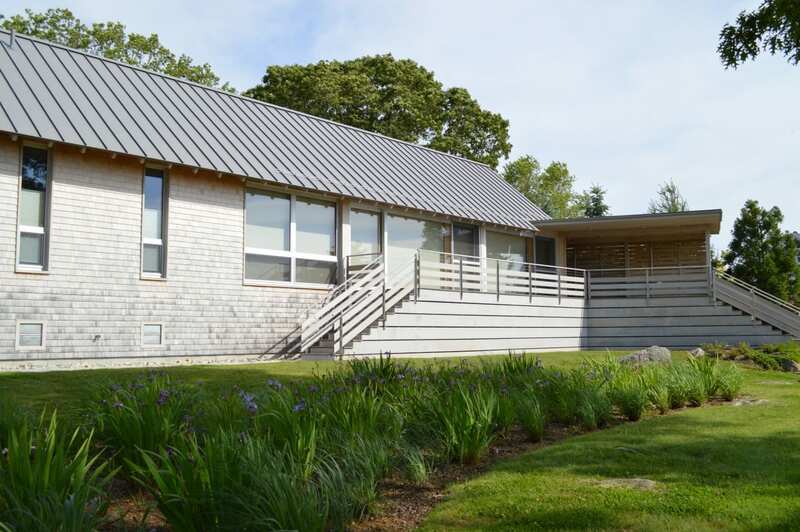 A rain garden provided a catchment area for roof drainage and further protected the water quality of the coastal site. Initially, we created a program for eradicating the lawn and specifying the species that would occupy the niches in the landscape identified by the ecologist, from extremely well drained soils to moist areas. 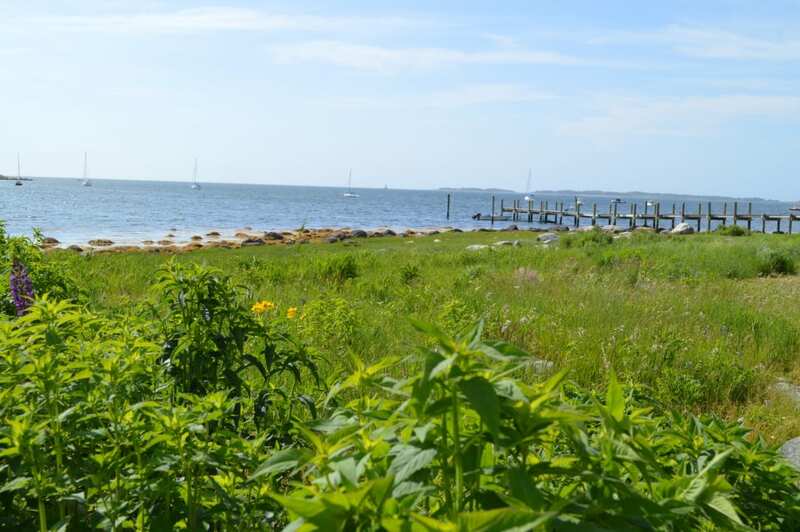 In addition to the plant species and biomass, we also enhanced the aesthetics of the property, which now has a beautiful and seasonally rich foreground meadow overlooking Fisher’s Island Sound. Local genotype seeds were both desired and sought in this project. Our experience with landscape restorations has been fulfilling on many levels. Our clients are gratified; we have created habitat for native birds and pollinators; and we have added to the richness and biodiversity of our local landscapes. Anne Penniman, ASLA, is a registered landscape architect with over 30 years of experience in both public and private work. 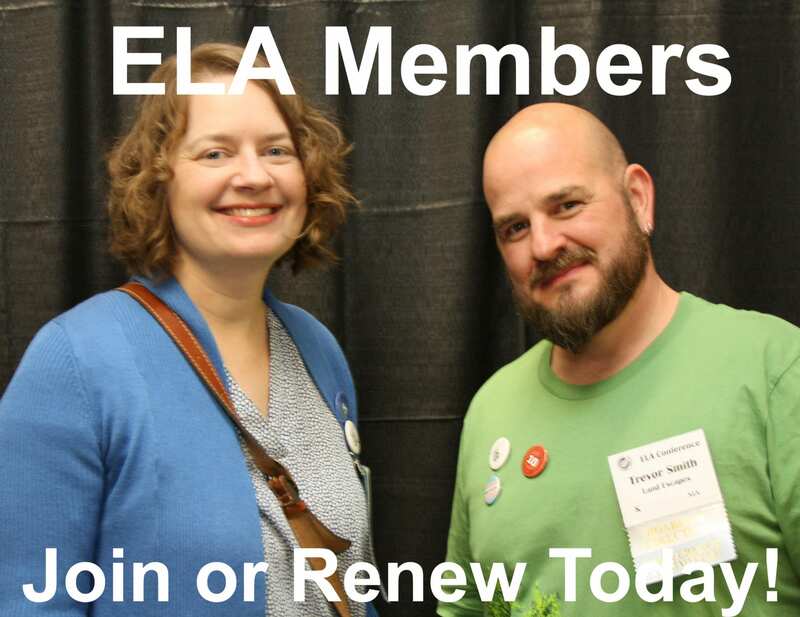 She received her B.A in American Studies/History from Yale University and her Masters in Landscape Architecture from the University of Virginia. Anne Penniman Associates (APA) has implemented designs that range in scale from private contemplative gardens to public park master planning. APA’s mission is to reveal meaingful, sustainable, and beautiful solutions for each site, honoring the structure presented by the architectural context of the project while integrating the natural and ecological elements of the site.